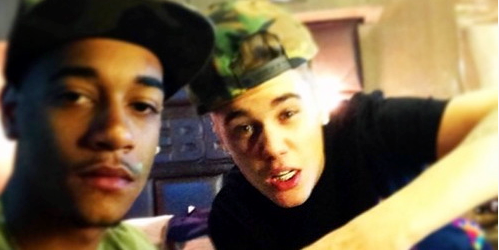 Justin Bieber's rapper pal Lil Za strikes a plea deal after being caught with drugs inside the teen pop star's house. Lil Za just struck a plea deal in his felony drug and vandalism case ... pleading no contest to felony drug possession ... but if he keeps his nose clean ... the judge will cut him a break. TMZ broke the story ... Za was charged with 2 counts of felony drug possession -- for Ecstasy and Oxycodone -- after cops found drugs near him during their raid in January at Justin Bieber's house. The judge will reduce the felony charge to a misdemeanor IF Za doesn't violate the law for the next year. He has to do 20 hours of Caltrans labor -- picking up trash. And he has to complete a drug program. Za -- who is repped by attorney Shawn Holley -- also pled no contest to misdemeanor vandalism for breaking the jailhouse telephone. He has to pay $600 for the phone. It's interesting ... Za cops a plea as the D.A. decides whether to charge Bieber with a misdemeanor or a felony for the egging case.